A captivating exploration of how a family gets a farm ready for the snow of winter, Sleep Tight Farm lyrically connects each growing season to the preparations at the very end of the farm year. All year long the farm has worked to shelter us, feed us, keep us warm, and now it's time to sleep. A cumulative tale of a farm maiden who, aided by a group of animals, prepares "Arroz con Leche," or rice pudding. Includes recipe and glossary of the Spanish words that are woven throughout the text. When a young boy in Korea dreams of eating a New York bagel, he asks a farmer, a fisherman, a beekeeper, and a baker for help. Annie is a very busy apple farmer. She bakes yummy treats with the apples she picks and saves her most beautiful apples to sell fresh at the farmers' market. Includes three recipes using apples. From the whippoorwill's call on the first day of spring through the first snowfall, Edna and members of her family gather fruits, berries, and vegetables from the fields, garden, and orchard on their Virginia farm and turn them into wonderful meals. Includes facts about the life of Edna Lewis, a descendant of slaves who grew up to be a famous chef, and five recipes. 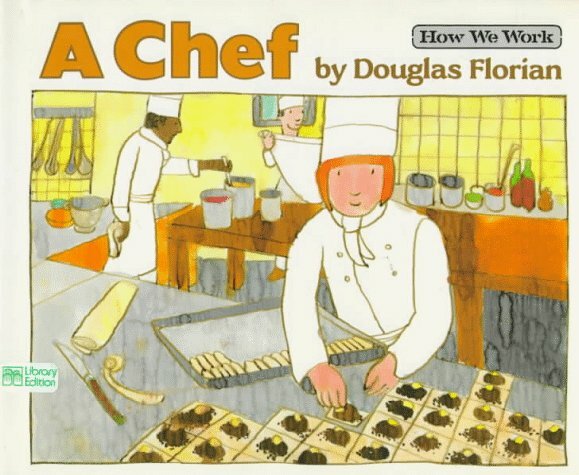 A step-by-step description of a day in the life of a restaurant chef--from the morning marketing to the final meal--sets preschoolers dreaming of what they want to be when they grow up. The Goofy Gourmet and a charming, blue hippo prepare for a wonderful surprise party. This is a delightful storybook which creatively suggests ways to spend time with kids in the kitchen. Wanda Belch is the new cafeteria lady at school. Rumor has it that she drives a garbage truck to school. And her favorite dish is "Souffle of Science Experiments!" A humble fisherman is taking a nap in his boat when a tourist interrupts him. The outspoken tourist points out that instead of napping, the fisherman could go out and catch more fish, which would eventually earn him enough money to buy a proper motor-boat. The tourist continues to embellish his idea, envisioning canneries, restaurants, and private helicopters. But the fisher­man has his own ideas about what success looks like. When a lonely fisherman finds an injured bird on his boat, he nurtures it back to health and—since the bird can no longer migrate with its family—charts a course to head south for the winter. Together, the two form a special friendship and enjoy life at sea until both the healing process and the journey must come to an end. Curious George's interest in helping a fisherman catch more fish ends in disaster, but he is able to redeem himself later.